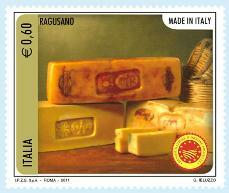 Four of Italy’s most prestigious cheeses are being featured on a new series of Made in Italy postage stamps. Or almost four. The Italian postal service didn’t get it together to deliver our Ragusano cheese stamps in time for the inauguration, so they are not yet available in Ragusa – maybe they used the wrong amount of postage? We are very happy down here in Sicily that Ragusano cheese has been included in this Italian stamp collection, as it’s a big deal to be selected from so many great Italian cheeses, and we anxiously await the stamp’s arrival. Naturally, parmigiano reggiano is featured on one of the Italian cheese stamps, as it’s considered to be the king of all Italian cheeses – if an Italian could have only one cheese for the rest of his life, he’d probably choose parmigiano reggiano. But then again, it would be very hard to give up gorgonzola or mozzarella di bufala campana, also featured on the cheese stamps. Luckily, we don’t have to. Read about our short culinary tour Bellissima Bologna, where we see parmigiano reggiano being made. For Ragusano cheesemaking, visit Walking & Cooking in Eastern Sicily. Oh my! Those are some of the coolest stamps ever! Thank you for telling us about them stateside . 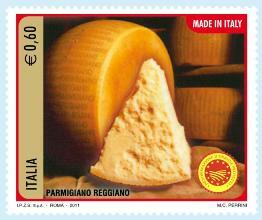 I have still yet to find any of these stamps at the post office in Ragusa…but at least I can always get the real cheese!